A child's bedroom is more than just a place to sleep. It's a place to play with toys. Be artistic. Have a dance party. Hang out with friends. The carpet in a child's bedroom needs to be able to stand up to all that activity and still be cozy and comfortable underfoot. Wondering which type of carpet is best for your kid's bedroom? All woven carpets are constructed with a loop pile surface. Loop style carpets leave the loops uncut for a continuous surface that resists crushing and matting. Looped carpet doesn’t show footprints or dirt as easily and is easy to vacuum. 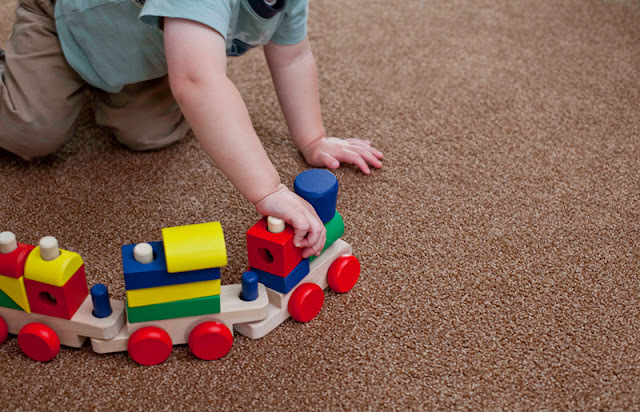 Some looped carpets are more comfortable than others - an important factor in a child's bedroom carpet. You'll want to feel samples for yourself but we recommend starting with level loop carpet. These carpets tend to use a softer yarn which will feel nicer while still being a durable choice. Cut pile carpet is the most common type of residential carpet in Indianapolis. Cut pile carpet is created when the loops that result from weaving are cut and allowed to slightly tuft, giving the carpet a dense, soft appearance. It’s durable because of the type of fiber used, the density of the tufts and the amount of twist in the yarn. More twisted yarn will hold its shape longer which makes it a smart choice for higher traffic areas. Stay away from saxony style carpets for a busy child's bedroom. These plush velvety carpets are beautiful and soft but they don't stand up to heavy use as well as other styles. When the yarns from a cut pile carpet are tightly twisted, you have a distinctly different type of carpet that is also very durable. Twist carpet styles often come with different shades of yarn to better highlight the twisted, bent yarns. Twisted carpets do not show wear and tear as quickly as other carpets and are very popular choices right now for any room of the house. Shags (yes shag), frieze and mixed textures - with some cut loops and some uncut loops - are all great carpet choices for a kid's bedroom that let you add a sense of style alongside practicality. The flooring experts at Kermans are ready to help you find just the right carpet for your child's bedroom. Whether you have a child dreaming of a bubblegum pink carpet or a rough and tumble kid who is looking for a place to play, there is a style of carpet just right for the room and your budget.